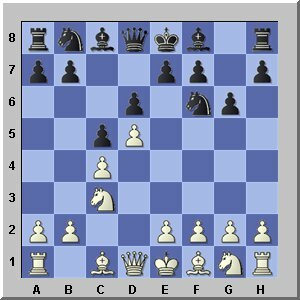 The Six-Pawns-Attack is an unusual chess setup for White against the King's Indian defense or the Benoni defense. I believe the Six-Pawns-Attack is not played at all in serious tournament play. 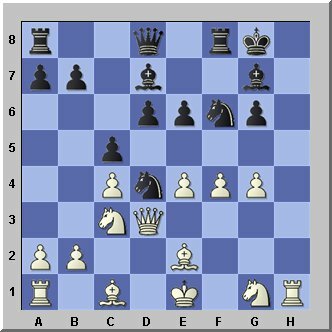 To play an opening like this seems dubious to a chess players mind, to move so many pawns in the opening and expose the king at the same time, to attack so early. There must be something wrong with this chess setup. Something like this can't be correct. This line of play MUST be punished by Black. This is not the way how chess should be played. One day God gave the SIX-PAWNS-ATTACK unto man and all chess players on the planet EARTH were screaming: Man! You can't play chess like that. Everybody knows that! Really?! Is that so? This would be the way how the logical thinking process of a chess players mind would evolve. Yes! This is so....I agree BUT still, there is a shadow of a doubt in my mind. And has it ever been proven that the Six Pawn Attack is not playable?? Is there a refutation known to men... somewhere? I don't know any! I challenge you. Play this opening in a serious game. Probably your game will be the first in the database since a long time. Your opponent might be extremely surprised and you might win just like that and run him over because he has no idea how to handle "this crap". You can't mess around when you have Black. If Black keeps wondering what to do and plays too slow, White will overrun him at the kingside as Black will have no counterplay at all. Black's knight on d4 will just sit in the center, very lonely and waiting for something to happen...and might wait forever. There is a saying in germany: One bird is not making a summer. One black knight in the center (on d4) is not making a center attack. After all this chess setup might not be bad at all but just has been forgotten and is out of fashion. If Black does not play 6...c5 but 6...Na6 (which is followed by 7...e5 - which will blast open the center) then forget about the Six-Pawns-Attack and switch over to the Four-Pawns-Attack and play 7.Nf3 instead (and not 7.g4). You can't play 9.g4? in the above diagram, because of 9...Nxg4! 10.NxN Qh4+ and you lose. Open the h-file as fast as possible. Don't waste time! You don't have any! Later on you MIGHT castle long or you don't castle at all but move the king to f2 or d2(somewhere) to get your a1-rook out. At this stage I firmly believe that the white knight must be placed at g5 most of the time! 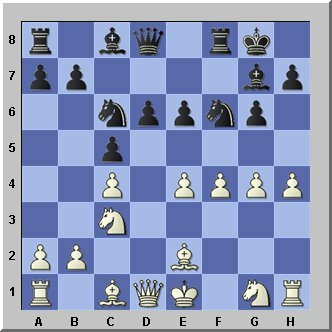 So don't move a pawn to g5 unless it is profitable, as this pawn will block this square for the knight. Check this out! 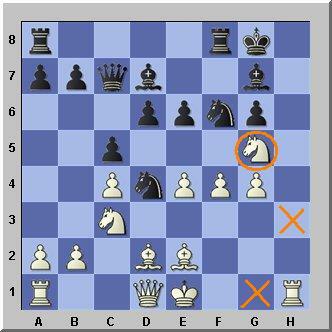 The Queen must get somehow to the h-file if possible or to d3 to put x-ray pressure on the weak pawn on g6! If Black does not play Qa5 fast, you first play your queen to d3 to avoid that the queen gets locked in by the d2-bishop and after that play your bishop to d2. From there the queen can go to h3 later on or sooner or later you push the e5 pawn and attack the g6-pawn with the queen at the same time. This should be your "dream-position". 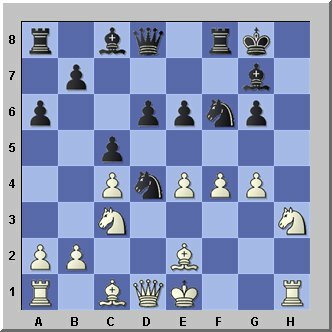 Black has wasted time with 10...Bd7 (instead of playing 10...Qa5 after which your queen gets locked in after 11.Bd2) But now your queen is out and IS ABLE to go to h3 sometime. Most importantly you can play your bishop to d2 and castle long. What's wrong with that? White has a slight advantage. You can apply the Six-Pawns-Attack even better if Black plays the Benoni defense, because the center is closed already and Black can't play the uncomfortable variation with 6..e5 which I will call the anti-six-pawn variation. 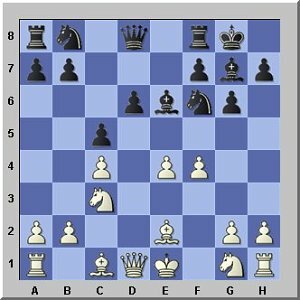 (see replayable games) which blasts open the center..
You enter the same position but this is only possible if Black does not play e6 early, but plays d6 first and fianchettoes his bishop. See the following diagram.